Vauxhall Cross to be transformed? It seems at long last things are beginning to happen at Vauxhall. At the Lambeth Cyclists May meeting we had discussions with a Lambeth transport planner working on the Vauxhall Cross redesign. Following a positive consultation response earlier this year the council and Transport for London have agreed to implement changes to give the area a greater sense of place - a destination rather than just a transport interchange. At our meeting we saw possible designs for two-way working on the gyratory system to make it more cycle friendly. Various other quiet routes through the area were discussed, using, for example, Miles Street as an additional signed route. A new bridge is also being considered from Nine Elms to Pimlico/ Chelsea. Draft Plans are expected to be published for consultation this Autumn with building of the new design due to start in 2017. In our discussions we stressed that Vauxhall Cross cannot be taken in isolation - the surrounding roads such as Durham and Harleyford Streets and South Lambeth Road must also be considered as part of the scheme. Cycle superhighway 5, which will improve the situation for cyclists coming from the Oval, is being developed separately and is expected to be completed by the end of 2015. May 2011: Vauxhall Cross: Change on the horizon? 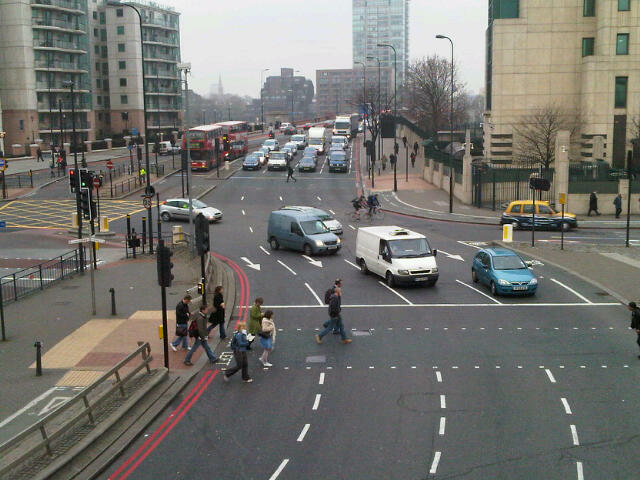 September 2003: Goodbye to dreaded gyratory? Join us on Saturday 30 May 2015 for our next leisurely ride around the London cityscape. This month we will be looking at graffiti around the city. Often thought of as a fairly recent phenomenon street art or graffiti in fact has a long history dating back to prehistoric times. It was well established in the Roman era with several notable examples in the ruins of Pompeii. London’s street art developed more vigorously after Camden Council invited over some US graffiti artists in the 1970s. 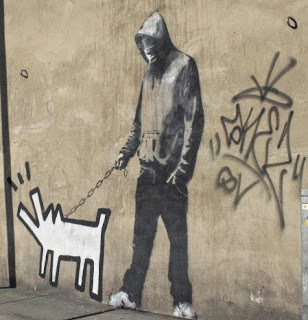 In the UK Banksy brought graffiti into the art main stream with his work fetching hundreds of thousands of pounds at auction. Ambitious street artists now use a range of techniques and liaise with organisations that provide legal walls for large pieces. 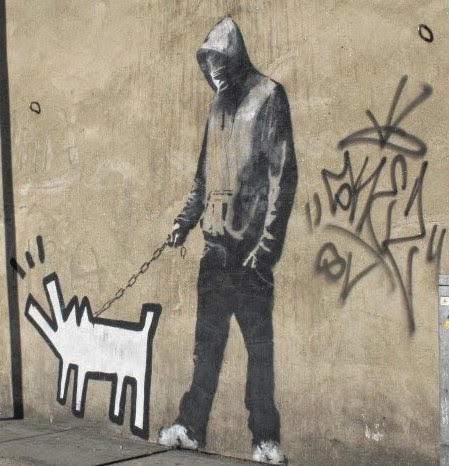 We will visit several walls in Shoreditch, including another Banksy and then go on to Fish Island and Hackney Wick. If time permits we will also visit Camden, otherwise the ride will end in the Hackney Wick/Olympic Park area where there are many choices of rail and DLR transport. We aim to finish at 5pm. We will stop for lunch in a pub or cafe along the route. 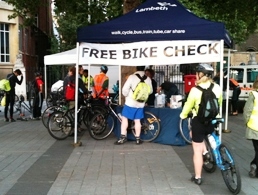 Lambeth's Sustainable Transport Team will be running their Dr Bike service this evening, 20 May 2015, outside the James Clerk Maxwell building opposite the Imax Cinema, Waterloo Roundabout, Lambeth SE1 8XT. Come along 5 -7:30pm and get your bike ready for summer cycling. At our next meeting (7.30 - 9pm at Stockwell Resource Centre 1 Studley Road, Stockwell SW4 6RA) we'll have our AGM and have an update on Vauxhall Cross developments, see below. It's also our AGM, so if you're interested in joining the committee please let us know on the night. For your May meeting there will be a representative for Vauxhall Cross but nobody from Lambeth or Sustrans. I should also be able to update you on wider issues such as Nep2, 20mph, Equality Streets at these meetings, but if there is a lot to update you on (Nep2 and 20mph should be gathering pace soon) I could attend intervening meetings if I am available. 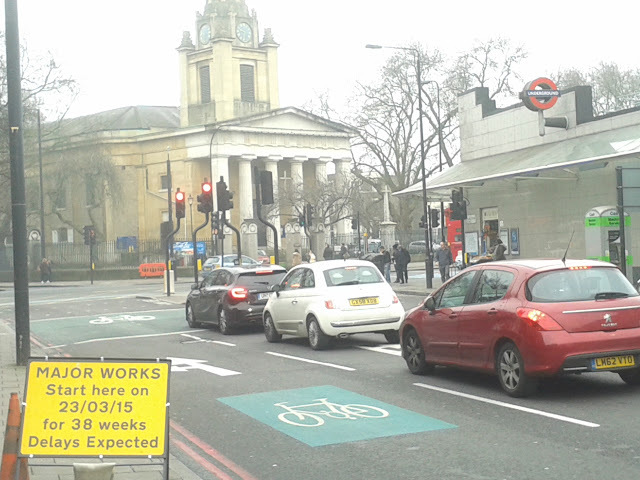 Are Kennington Junction works leading to speeding traffic in Fentiman Road and Albert Square? Works on TfL's scheme to transform the junctions around Oval tube station in Kennington under the Better Junctions initiative began in March. The works are expected to be completed by the end of the year. One effect of the roadworks that some members have noticed is more rat running on side roads around the junctions such as Albert Square and Fentiman Road. We will be pressing for greater filtered permeability for these roads to restrict through motor vehicles.